Earlier this year, First State Woodturners received an EOG Grant from our parent organization, the AAW. Our plan was to buy a portable mini-lathe which we would use to re-introduce woodturning into two local Delaware high schools as part of their STEM Design Lab programs. We are happy to report, thanks to the resourcefulness and thriftiness of our members, our club was able to purchase TWO lathes! 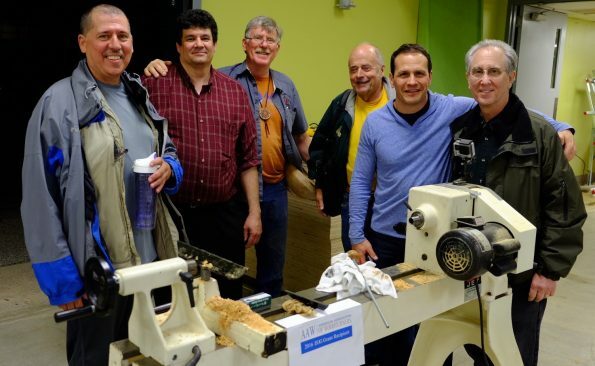 Our club now owns a slightly used full-sized Jet 1442 and a slightly used Vicmarc midi-lathe, plus various accessories and safety equipment. The larger Jet lathe is on permanent loan to the Mount Pleasant High School STEM Design Lab, headed by Brooks Twilley. As part of our collaboration, Mount Pleasant has allowed FSW to meet and host nationally renowned demonstrators in their large shop space. Dale Larson, 3rd from left in the photo above, demonstrated in May. In July, the Vicmarc lathe was used for a one-week Woodturning Summer Camp for middle-school students at Wilmington Friends School. This smaller lathe will be transported between different venues and will allow us to introduce our local community to turning.